Well we made it back from Japan this week. Still suffering from jet lag but that is how it goes. I thought that I would continue the description of the trip I started in the last post and add some of the pictures we took. However, this takes a long time the way I am doing it so I will just be dribbling this out to you. 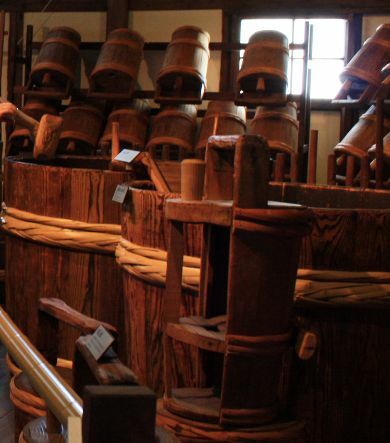 For this week, here are some pictures from the Hakutsuru Sake Brewery museum. 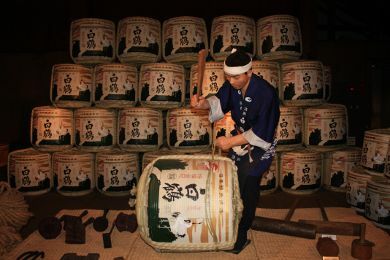 Stack of Hangiri or half cut barrels for making kimoto with kai-ire method. 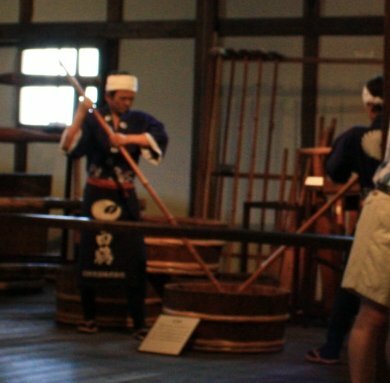 This picture is of a couple of kurabito (蔵人) making a kimoto (生酛) by preforming the yama-oroshi (山卸) process. They do this by mashing the mixture with a tool called a kai (???) that has a flattish part on the bottom of the pole in the kurabitos’ hands. 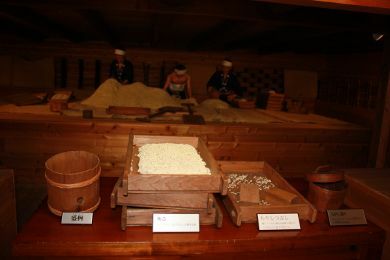 All of this mixing and mashing is done in a hangiri (半切), the half cut barrel. This picture has a tool, don’t know the name, used to regulate the temperature of the mash. 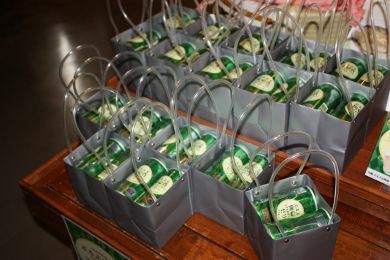 These are stored on a shelf in the back of the picture and a cut out version in the front center showing how it can be filled with hot or cold water before it is placed in the mash to control the temperature. I am on a trip to Japan. 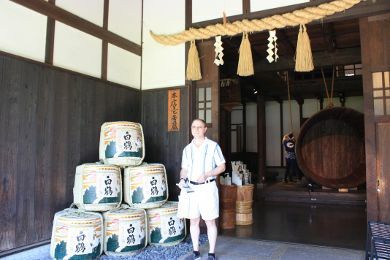 It is really a vacation trip with my family where I can slide in a little learning about sake; well maybe. Other than just passing through Narita International airport, I have not been to Japan for many years. The last time I was here, there was no romaji (Romanization of the street names and such) and very little English spoken from what I could tell. On this trip there is quite a bit of romaji making it so we can get around. It seems like most people have a little English but not enough to do much more than small things. Interestingly, in contrast, it seems to me that more people speak better English in Shanghai than here. The Osaka area is heavily “trained” and while a little scary and confusing at first we quickly developed our confidence and competence. 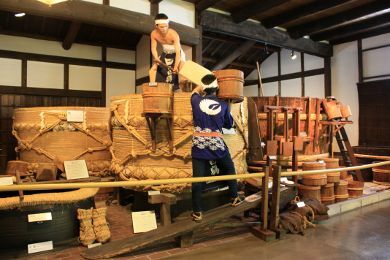 We made our way on the Hanshin line, through the Nada Go-go (五郷) or Nada five districts, over to Kobe to see the Hakutsuru Sake Brewery museum. 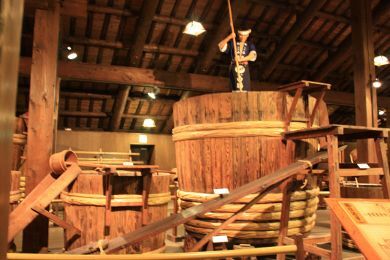 Nice museum with two cool fune (large manual sake press) on with a huge (literally a tree trunk 2’ in diameter) lever for pressing down a massive amount of pressure on the bags of moromi in the fune. I will post some pictures of this later if they turn out. We then went to see the floating garden which is perched high (around the 35th story) between two office towers. I don’t know why it is called the floating garden because I did not see any garden there but it did offer a full 360° view of the entire area of central Osaka. We could see all the way over to Kobe where we had just been and deep into the city on the other side. In the evening we went to Daimon Shuzo Mukune Tei to meet with Yasutaka Daimon, the owner and Toji. 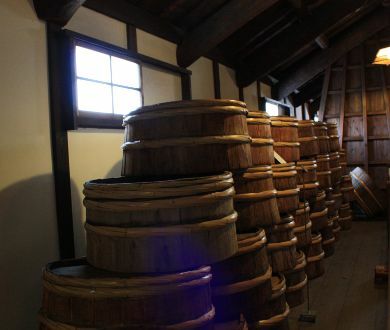 A restaurant above the brewery serves as a wonderful way to highlight their sake in a warm and inviting atmosphere. We tried 4 of Daimon-san’s sake, none of which are available in the States; a nama and two, maybe three, Daiginjo. Vary nice! (Daimon Shuzo has two brands available in the states, Mukune and Tozai) It was great to meet Daimon-san face to face and get to know him better.